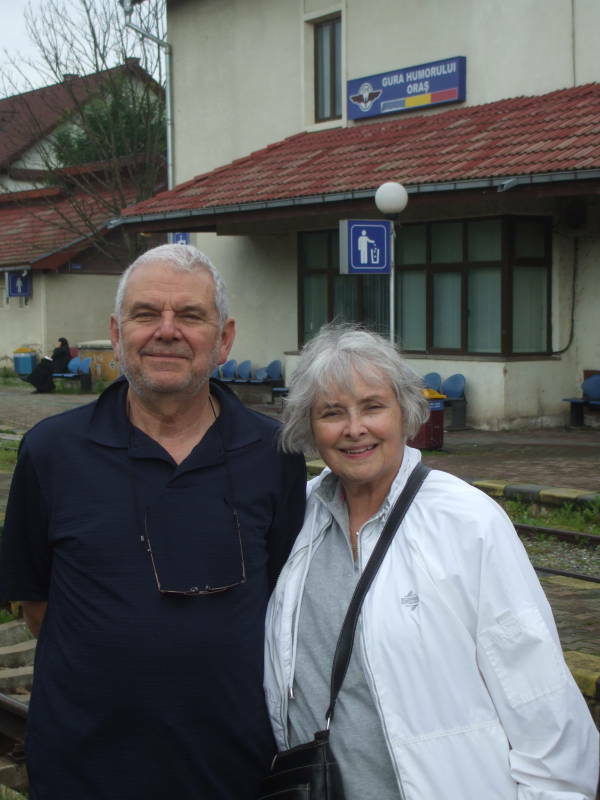 The next stage of our trip was from Bucharest, in southern Romania near the Bulgarian border, to the town of Gura Humorului in northeastern Romania near the Ukrainian border. 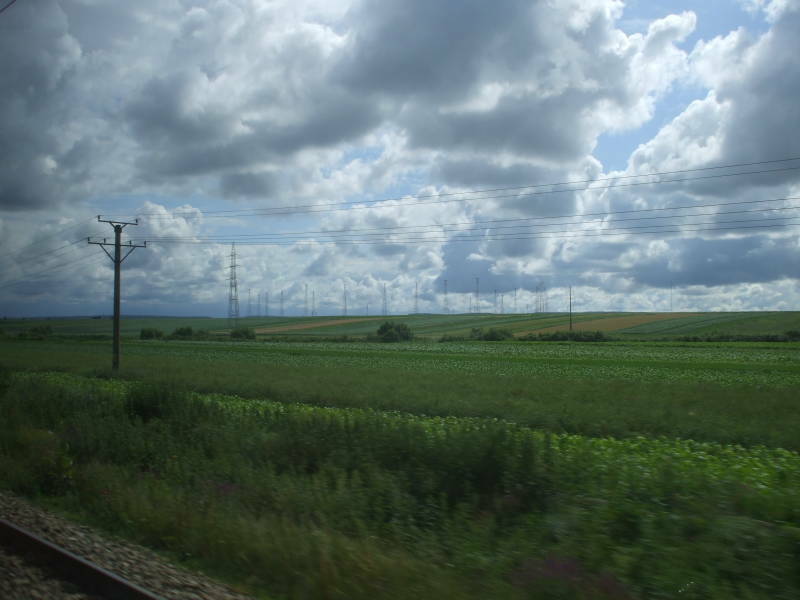 This is part of the Athens to Paris by Train series. In red: The rail line from Bucharest to Gura Humorului. This will take us through the oil fields around Ploieşti, north through rich agricultural land into the region of Moldova and the small city of Suceava. 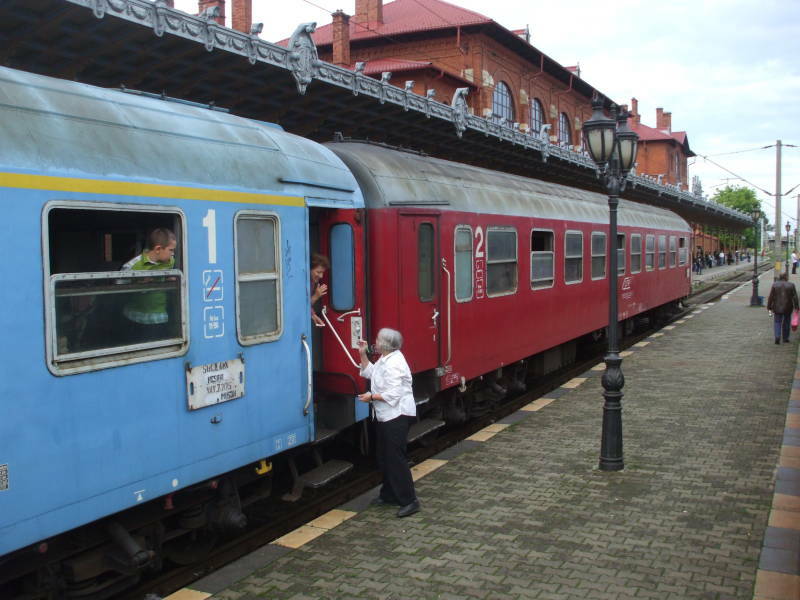 We will change there to a local train for the short connection to Gura Humorului. This is in the region of Bucovina, which straddles the border between northeastern Romania and southwestern Ukraine. 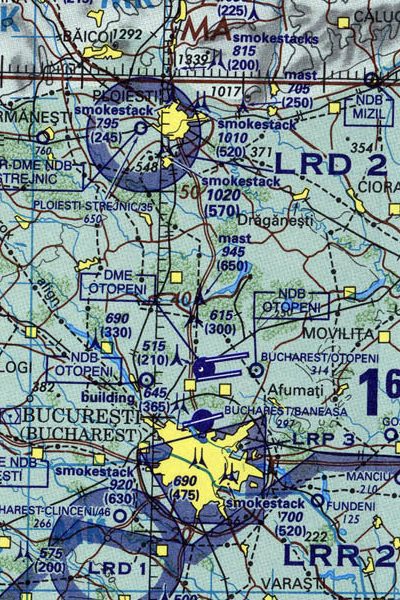 This first detailed map shows the first part of the trip, from Bucharest to Ploieşti. The rail line leaves the capital city to the north west, then turns nearly due north. The whole area from the Danube River at Romania's southern border, around Bucharest and north to Ploieşti, is filled with oil wells. 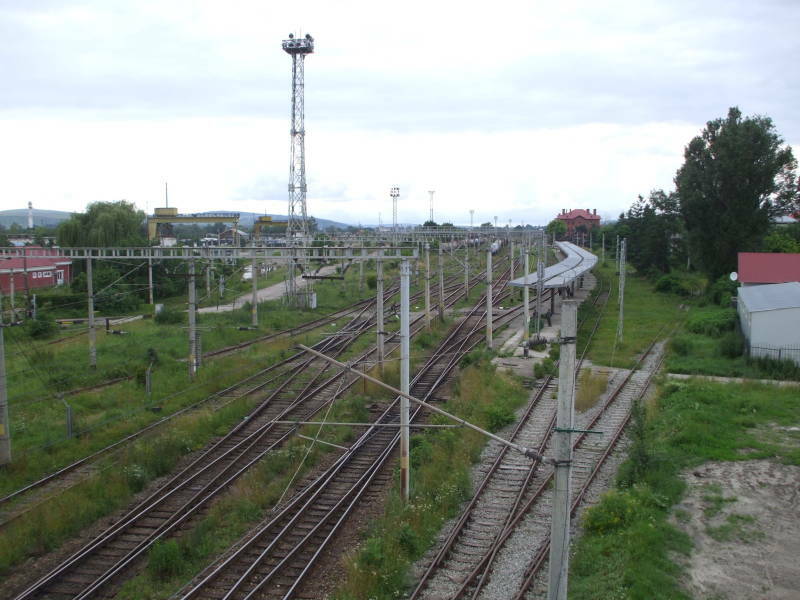 The rail line divides at Ploieşti. 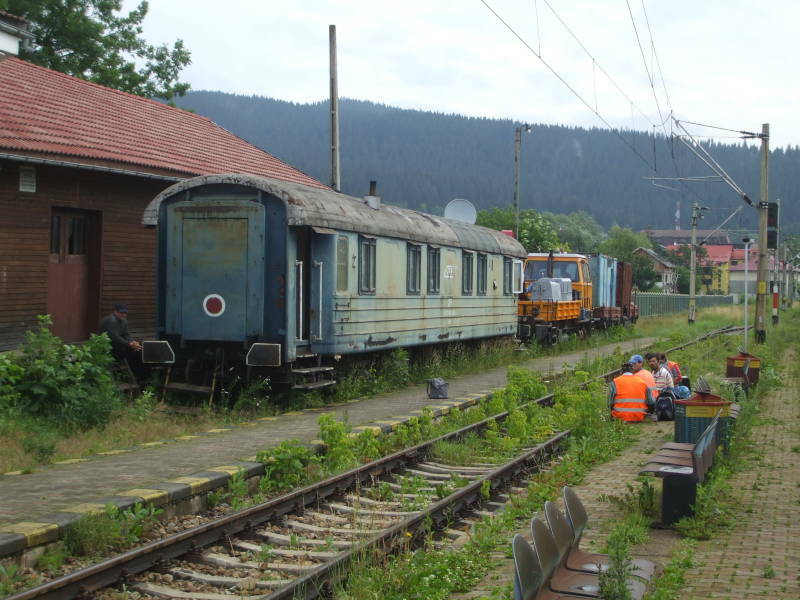 The line to the northwest runs through Braşov and Sighişoara and continues on to Hungary and Budapest. 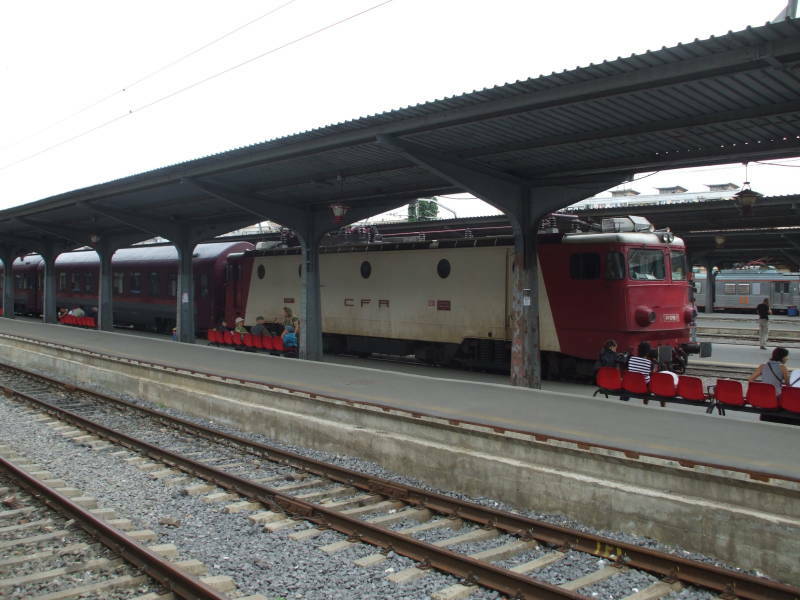 Our train will take the line running east from Ploieşti. The Kingdom of Romania was neutral in the early days of World War II. But a series of territorial disputes were resolved to Romania's loss in the summer of 1940, taking away most of the territory gained after World War I. Romania lost northern Bucovina and eastern Moldova to the Soviet Union. Northern Bucovina was absorbed into the Ukraine, and eastern Moldova became the Moldavian Soviet Socialist Republic. Other territory was lost to Hungary and Bulgaria. This loss of territory caused widespread dissatisfaction with the government. Fascist and military factions staged a coup in early September, 1940. King Carol II and his mistress were forced into exile, and a fascist dictatorship was installed under the control of conducător Ion Antonescu. The new fascist government officially joined the Axis Powers on November 23, 1940. Romania provided equipment, oil, and men to Nazi Germany, committing more troops to the Eastern Front than all other German allies combined. These Romanian troops played large roles in the fighting in Ukraine, Stalingrad, and elsewhere. Allied air forces started bombing Romania in 1943. 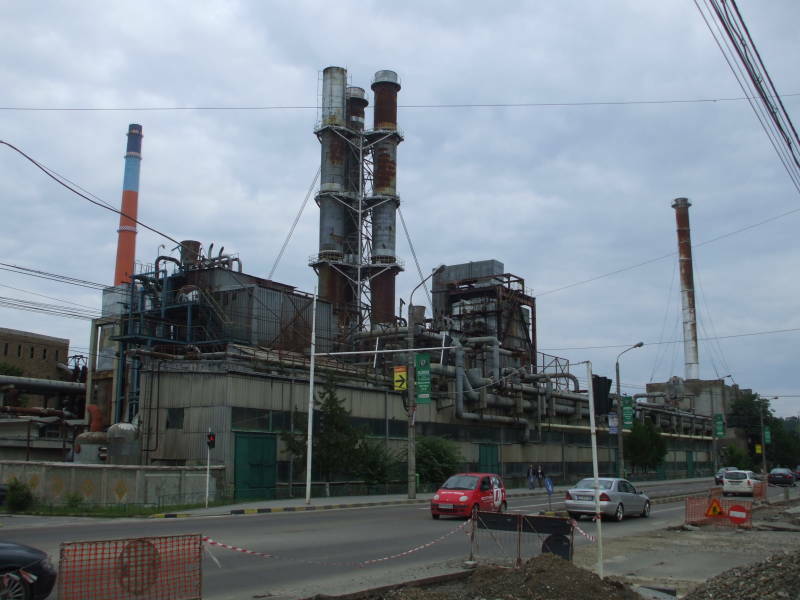 The most prominent mission was the Operation Tidal Wave attack on the oil fields and refineries around Ploieşti on August 1, 1943. The Soviet armies invaded in August, 1944. Popular support of Romania's participation in the war and of the fascist government fell, and King Michael of Romania led a coup d'état that deposed the fascist Antonescu regime and took Romania to the Allied side for the rest of the war. The rail line running east out of Ploieşti soon turns and runs north through eastern Romania, through the city of Bacău and the Romanian region of Moldavia. The eastern part of the historic region of Moldavia is now the Republic of Moldova, formerly the Moldavian Soviet Socialist Republic. North of Bacău we will eventually arrive at Suceava. We will change there to a local train making frequent stops as it winds its way to Gura Humorului and continues west and north from there. Gura Humorului is shown on this map but it is not labeled. I have superimposed a red "X" on it. 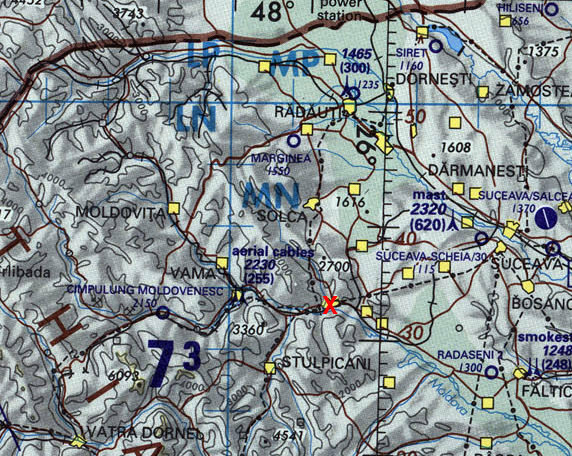 As you can see from the relief on this map, Gura Humorului is in the eastern edge of the Carpathian mountain range. 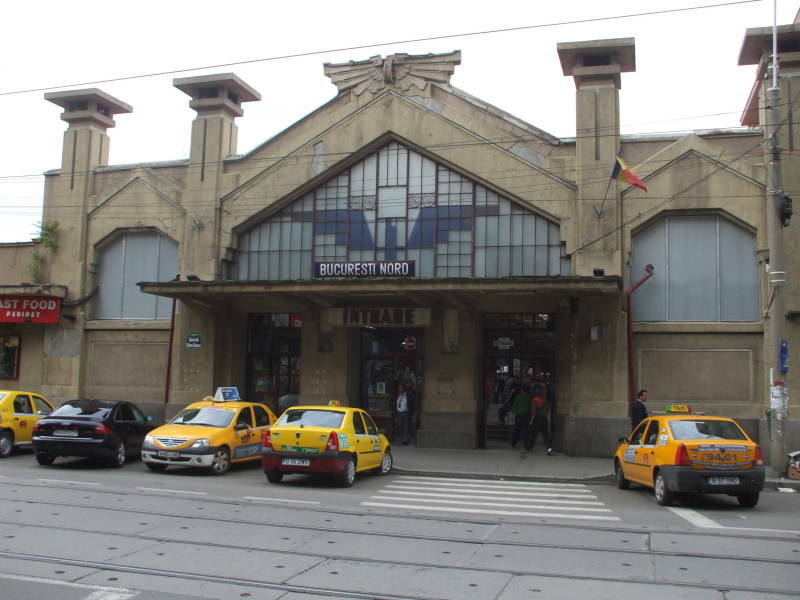 On the morning of the day after our arrival in Bucharest I went back to Bucureşti Gară de Nord, the main train station. I bought our tickets for both this next leg of the trip, from Bucharest to Gura Humorului, and for the following leg, from Sighişoara to Budapest. Our hotel was just a few blocks from the station and the purchases were easy. 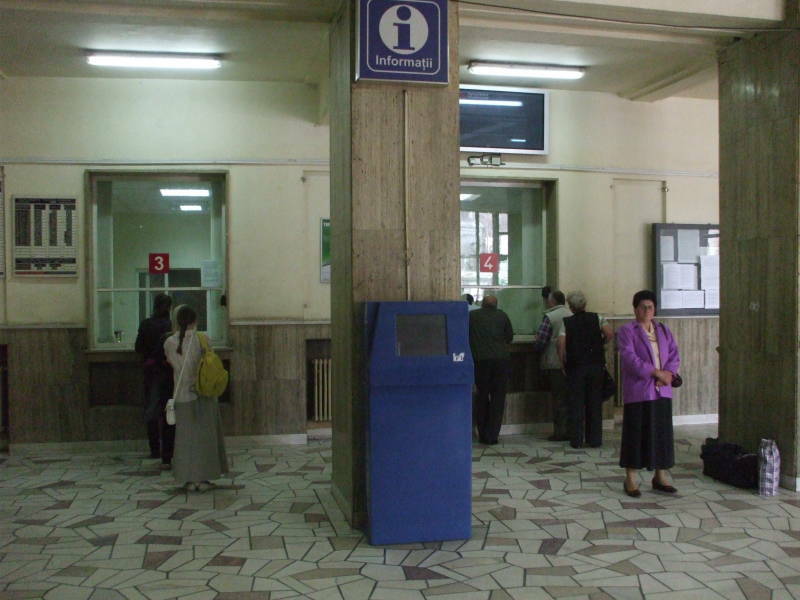 Case de Bilete, that's the ticket offices at Bucureşti Nord. It's really a hall with several specialized ticket windows. Special ticket window for sleeper cars and couchettes. This seemed to be where I needed to get our tickets for the later leg from Sighişoara to Budapest, as this would be an overnight train. Two two-person sleeper compartments and a cuşetă bunk for me. However, I was directed to instead go to the international ticket office, window #3 seen below. The international nature took precedence over the berths. 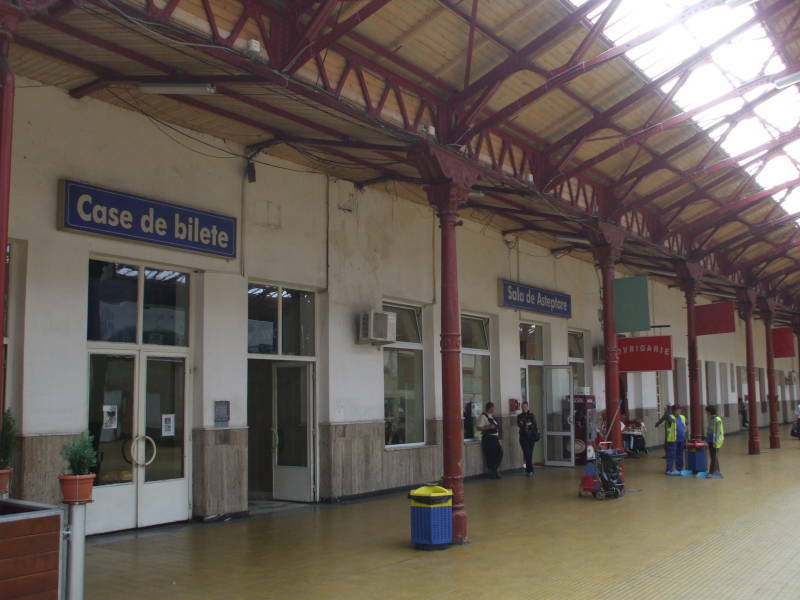 I had read that there was a Wasteels travel agency at the station (phone +40-21-231-0208), and you can have them set up your tickets. However, that office is closed on weekends. That was fine, it was very easy to purchase the tickets. I made it easier for me by having what we wanted written as simply as possible on a slip of paper that I could hand across. For the sleeper/couchette tickets, I had it split into three: two adults in one cabin, two adults in a second cabin, and one adult in a couchette bunk. 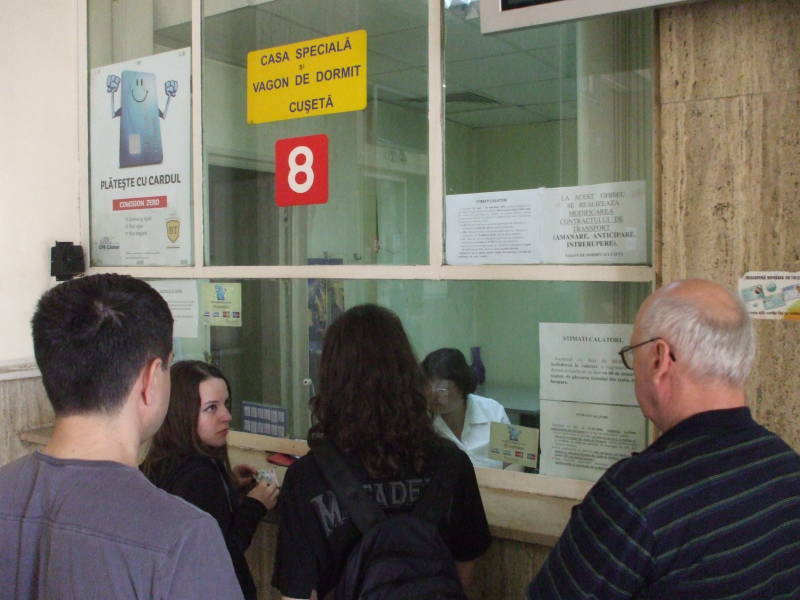 Once I got the more complicated ones set up for the following leg, I got the much more simple tickets to get from Bucharest to Gura Humorului at office #4, also seen here. 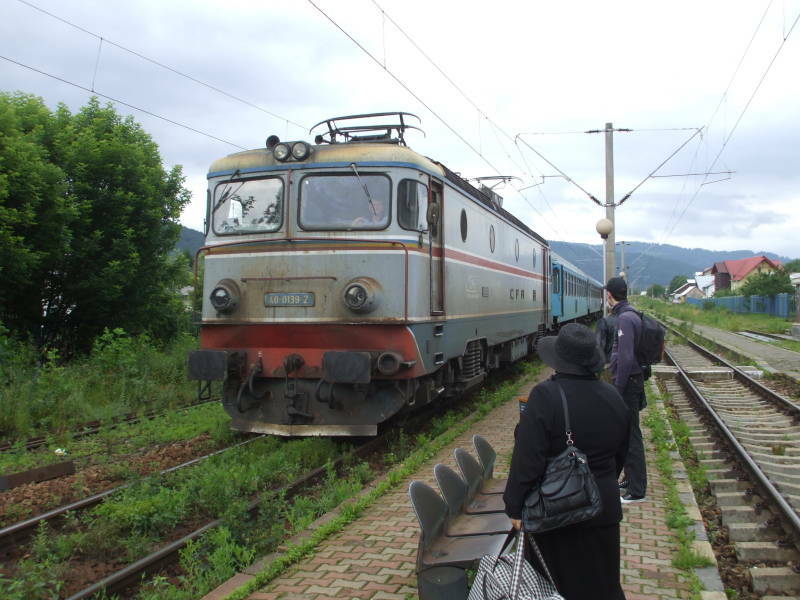 Train P5723 leaving Suceava at 1932 and arriving at Gura Humorului Oraş at 2033, just 47 kilometers. Gura Humorului is the town, Oraş means something like main station. Gura Humorului isn't a large town. 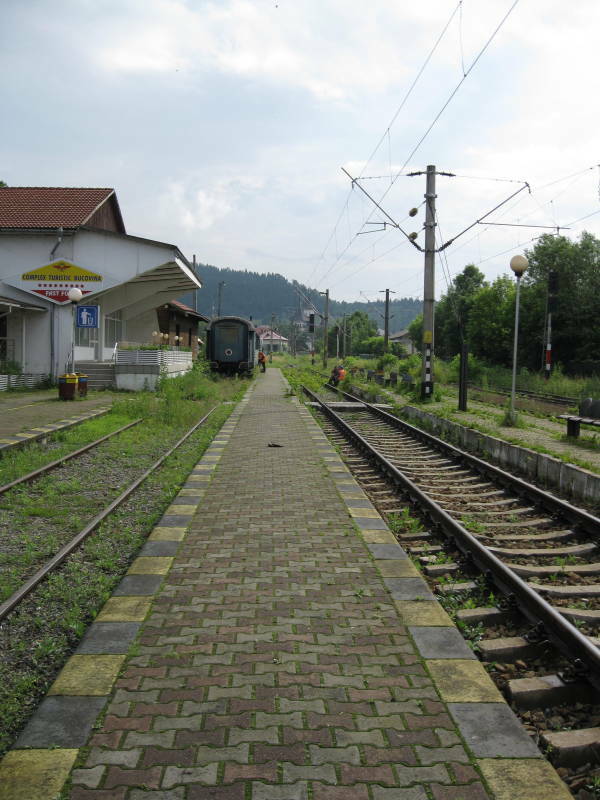 It seems odd for it to have a main station and smaller stations, but the trains that pass through Gura Humorului are the sort that stop everywhere, to the point that they may stop at either end and in the center of a town. 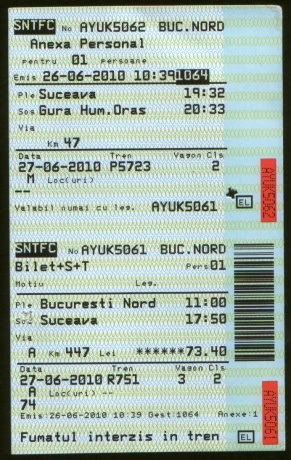 The entire ticket for the train to Suceava plus the second segment to Gura Humorului cost one person was 73.40 Lei. Larry asked me "What is a Lei worth? ", allowing me to answer "Twenty dollars, parson, same as in town." But if you must know, 73.40 Lei worked out to about US$ 22.31. The first train had reserved seats, this ticket is for seat #74 in car #3. The second train was very informal with seating more like what you would find in a subway car. You just find space wherever you can on that one. The R in the train designation R751 means that it is a Rapid train. 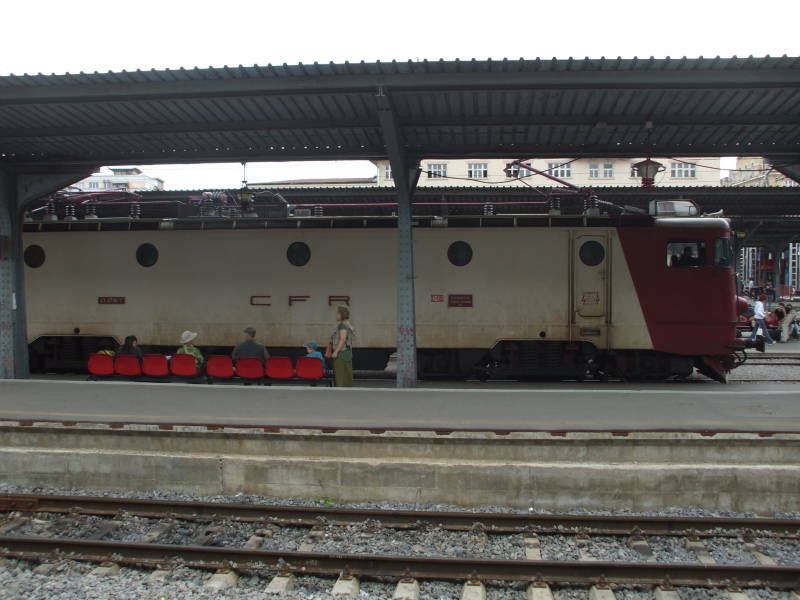 It is rapid in comparison to other trains, but it isn't a high-speed train. The P in the second train's designation P5723 means that it is a private railroad. It is operated by a private company and not the national railroad CFR. This isn't our train, but the one we took was very similar. 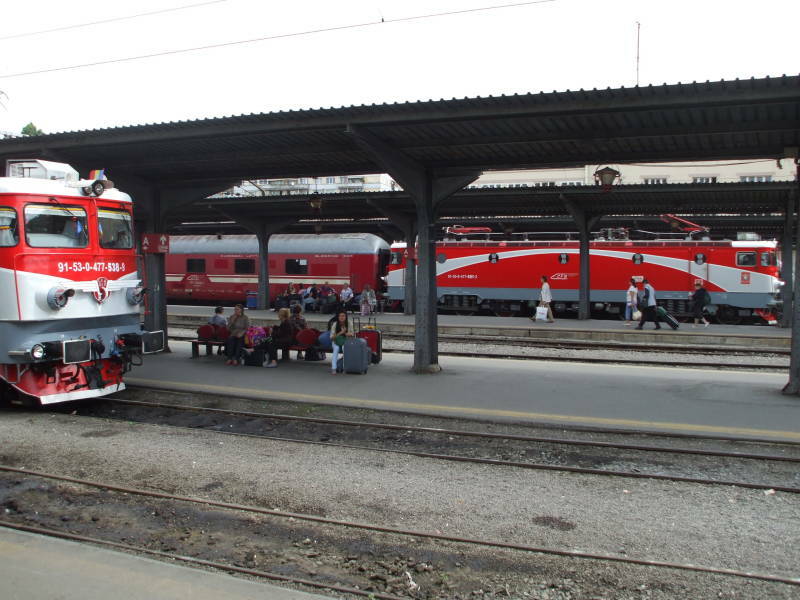 R — Regional — Formerly Personal, also known as navete or trenuri de navetişti, or commuter trains. They travel at the lowest speeds, use the oldest rolling stock, and stop everywhere. They are numbered 2000 to 9999. IR — Interregional — Formerly Accelerat and Rapid, used for medium to long-distance trains that stop only in cities and larger towns. They are numbered 200-499, 600-999, 1000-1999, and 10000-14999. InterCity (IC), EuroCity (EC), and EuroNight (EN) — numbered 500-599. 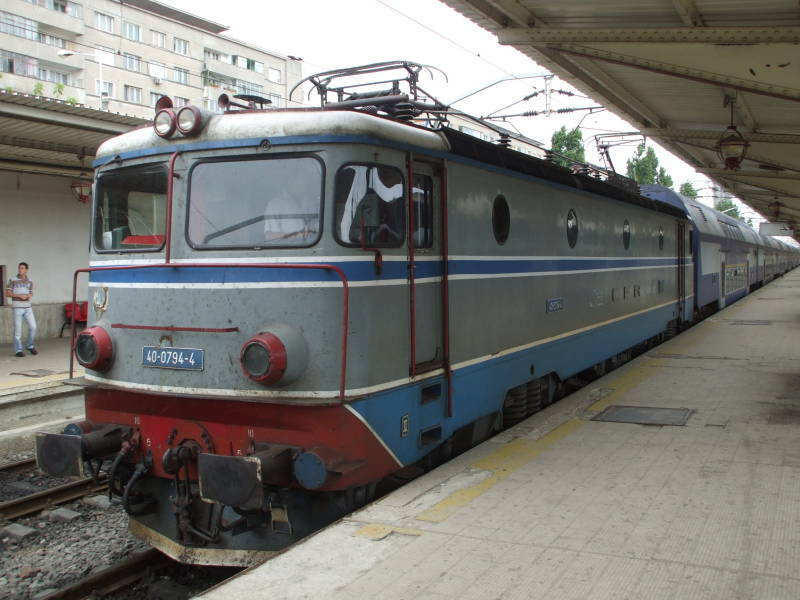 InterCity is the premier Romanian train type, traveling at the highest speeds between major cities. EC and EN are international trains. 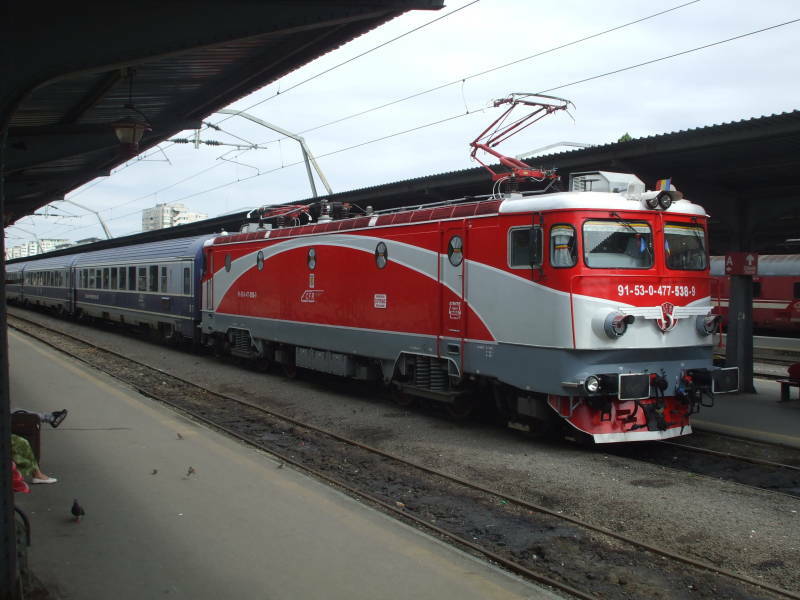 Some of the Romanian locomotives and passenger cars look brand new, or at least they are newly refurbished and painted. Others look as though they have been in use for several years. Either way, they are a pleasant and efficient way to get around Romania. There are long-haul buses, but I was told that the train would be much nicer if it was at all feasible to use it. This locomotive is of a older design, in the mostly grey paint scheme used before 1999. 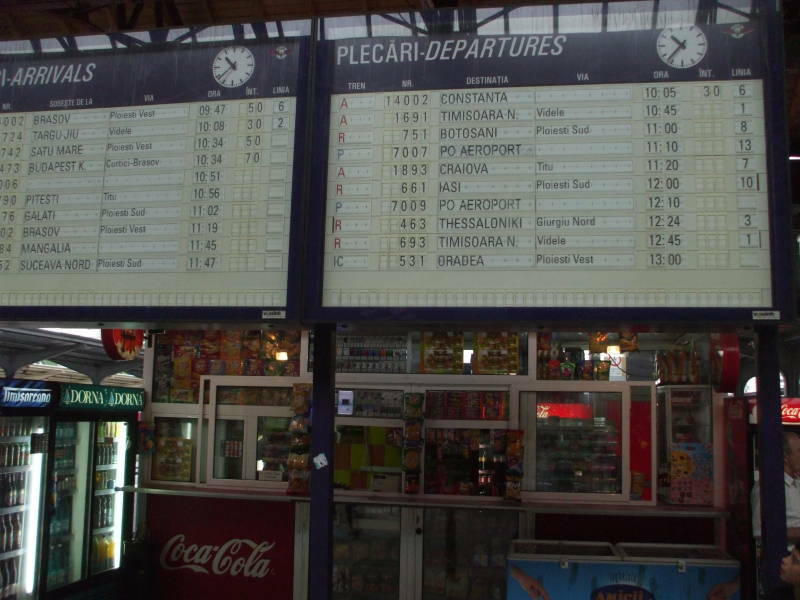 The departure board shows our train, R751, leaving at 1100 from platform 8, bound for Botosani via Ploieşti Sud. We will get off in Suceava, shortly before its final destination of Botosani. We boarded as soon as the train pulled in. A big crowd boarded, it was a little chaotic and it took quite a while to get down the aisle to our seats. Some of the crowd was made up of people who weren't going to ride the train but got on anyway. Some were peddlers and some were begging. One pitiful-looking guy came up the aisle pushing himself along the floor. His distorted and nearly useless legs were pushed along in front of him. He was plucking at the sleeves of everyone seated on the aisle. Then he looked out the window and saw the overhead power lines apparently moving — the train was starting to pull out of the station. He said "Uh-oh," jumped to his feet, ran down the aisle jumping over boxes and luggage, and leapt off the train. Someone said "It's a miracle!" and everyone laughed. Some of the peddlers must buy tickets, or else they must be in cahoots with the conductors. They make their way up and down the cars throughout the trip, laying out a wide array of goods and moving on without saying anything. In a few minutes they come back through and collect payment for anything you want to purchase. Larry and Shirley are tempted by the inventory. They didn't buy anything from this set but they did buy something later. 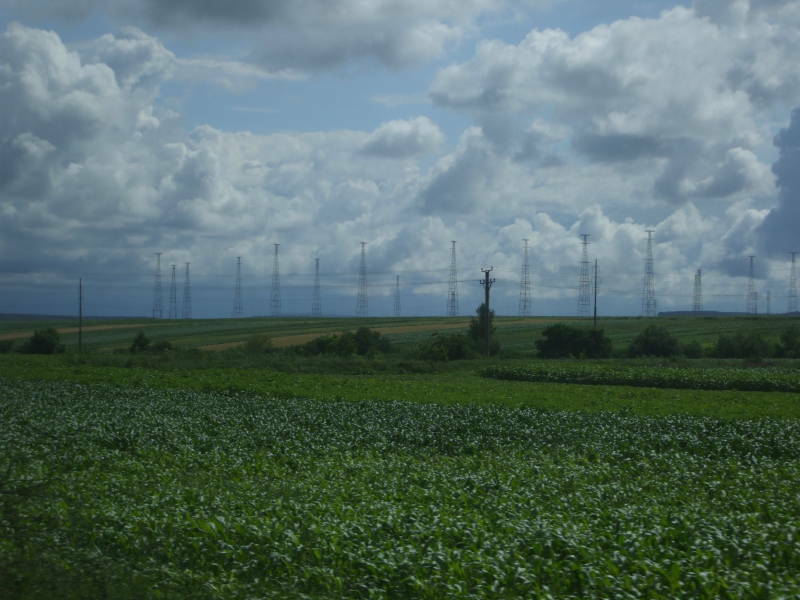 We passed a large HF antenna somewhere between Ploieşti and Bacău . I would assume that this is a Wullenweber array used for direction finding and interception, but maybe it is used for transmitting as well. We arrived in Suceava right on time. Everyone else waited at the station while I went out to look for the Autonom car rental office. We would return here in the morning to pick up a rental car. Google Maps and other mapping resources weren't all that detailed or even accurate in some areas of northeastern Romania in 2010. The car rental office was a little over a kilometer away, but not in the direction I thought it was. The second picture above shows the view if you turn to the left as you exit the station, as Google Maps suggested. Things got bleaker and the road narrower within a few blocks. 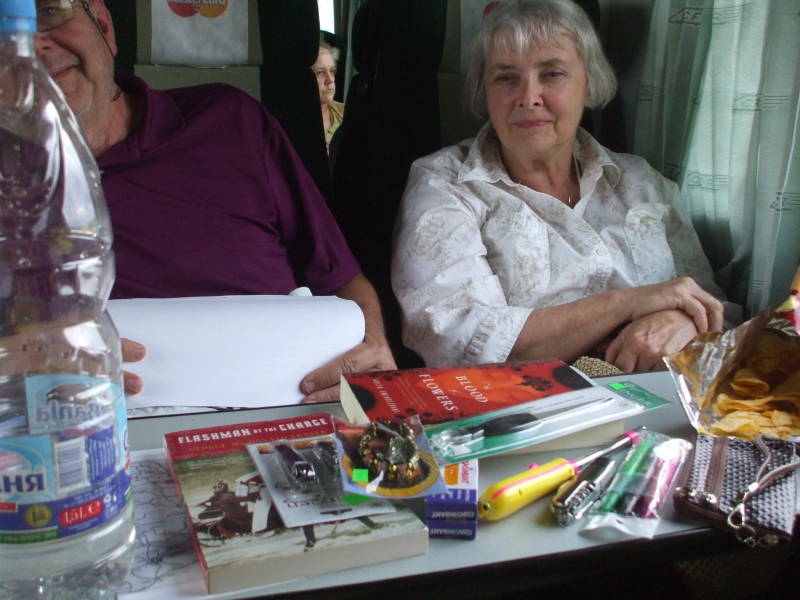 Meanwhile Shirley was saying good-bye to Anna, who had sat with us for the nearly 7-hour ride from Bucharest. Anna had another 45 minutes or so to continue, the same as us, but in the opposite direction. 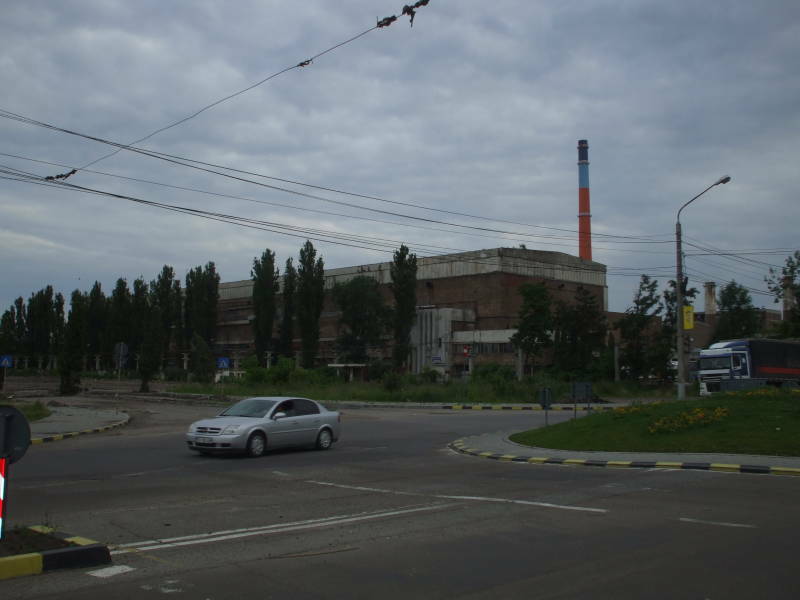 I was soon passing a series of industrial buildings. They might have been closed down, or maybe not. It was hard to tell. This industrial grime was the sort of thing I had expected to see here, far east in Europe almost to the former Soviet Union. However, just a little further down the road and I was passing a large shopping complex with a home-improvement store, a Carrefour supermarket, and other businesses that would be right at home in western Europe and, with a change in chain ownership, the U.S. I didn't get all the way to the Autonom office, but I found where it was. The plan was that we, or at least I, would return here in the morning to pick up our car. 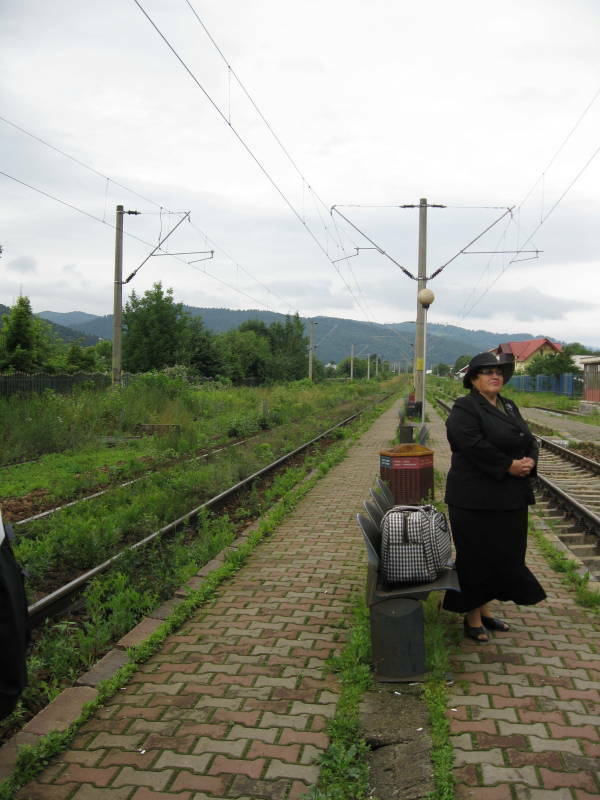 But for now it was time for me to get back to the station in time to join everyone on the short ride on the local train to Gura Humorului. The train we took was almost like a subway car. 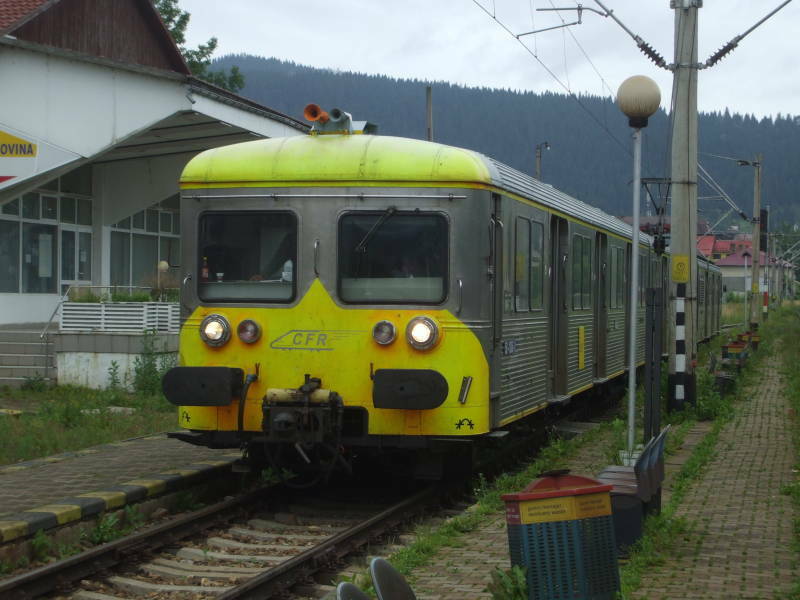 This picture is of a CFR operated train, but it is the same design as the privately operated one we took from Suceava to Gura Humorului. We're at the Gura Humorului station here. These are definitely local trains. We would cover just 47 kilometers in a little over an hour, with only one segment more than ten minutes between stops. Our schedule shows the nature of the local trains. Stroieşti is a commune of three villages: Stroieşti, Vâlcele, and Zahareşti. Ciprian Porumbescu was a Romanian composer born in what is now the Ukrainian half of Bucovina. One of the stations not located in one of the villages is named for him. 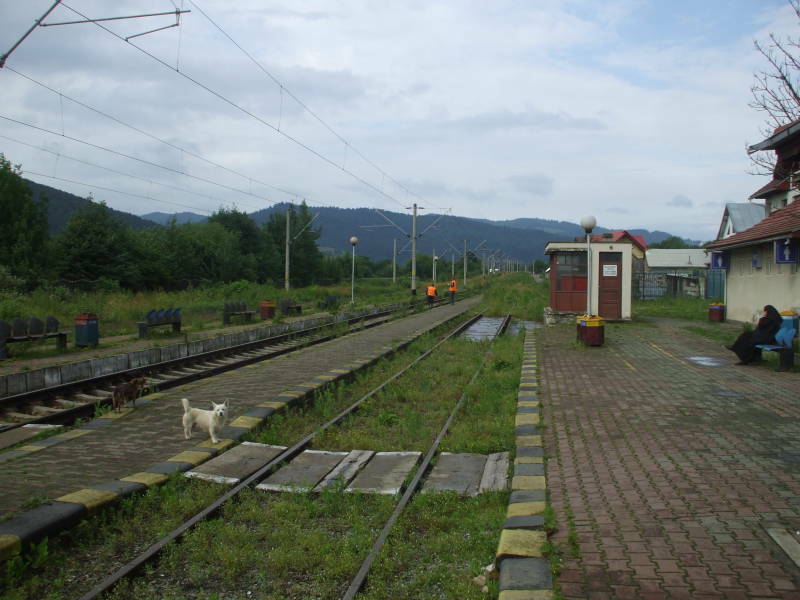 I think that was the station in the woods where one of the passengers stepped off the train, handed a puppy to the station master, and then got back on board. Berchişeşti is a commune of two villages, Berchişeşti and Corlata. Gura Humorului is the largest town along this route between the larger endpoints of Suceava and Câmpulung Moldovenesc. With a population of almost 16,000 people it's large enough to have two stations: a small one on the east edge and the main station or Oraş west of the center. Finally, we were in Gura Humorului! 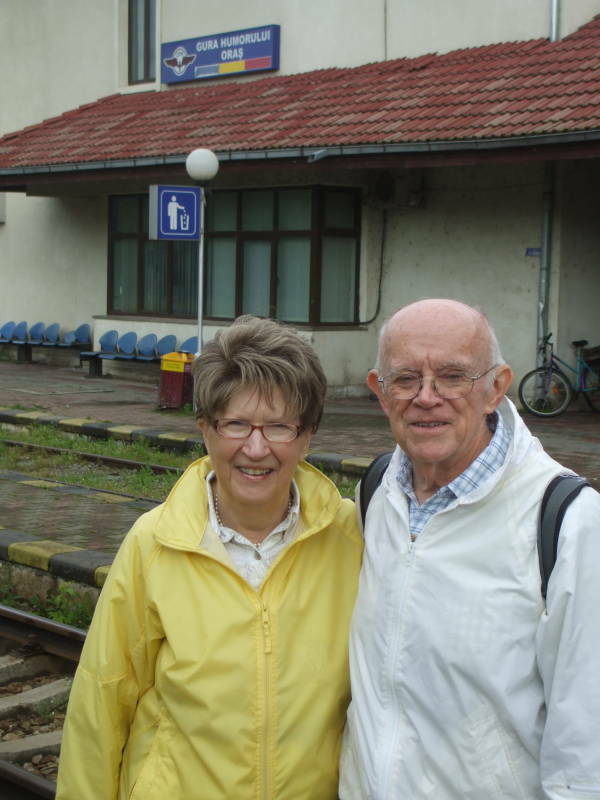 Here are Betty and Bill, and then Larry and Shirley, on the platform at the Gura Humorului Oraş station. 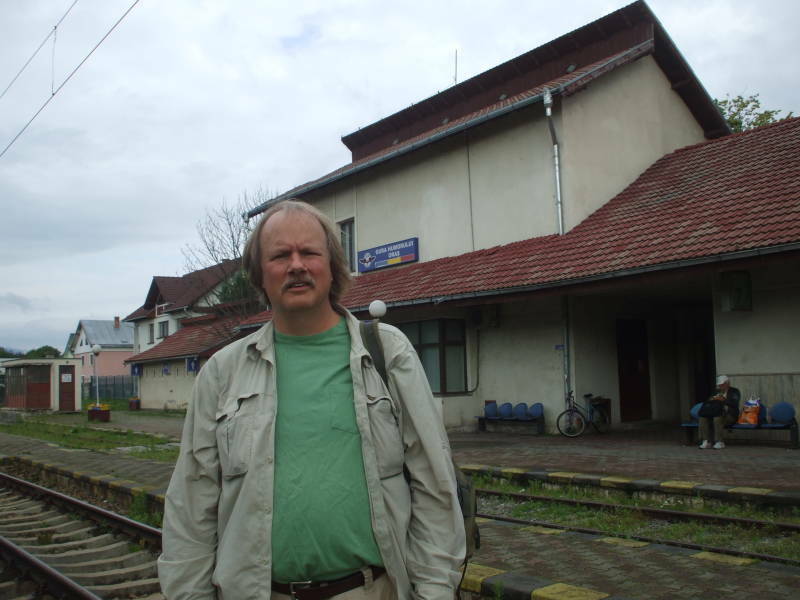 Gura Humorului's main train station isn't terribly exciting. An old woman, a non-fierce dog, some maintenance workers, and a lot of weeds. On the next day we arrived at the station right at break time. You see the high forested hills in the background. We are getting into the Carpathian Mountains, a north-south range of mountains that we are entering from the east. We're not very far from the Ukrainian border, but this seems to be a mostly monolingual Romanian area. 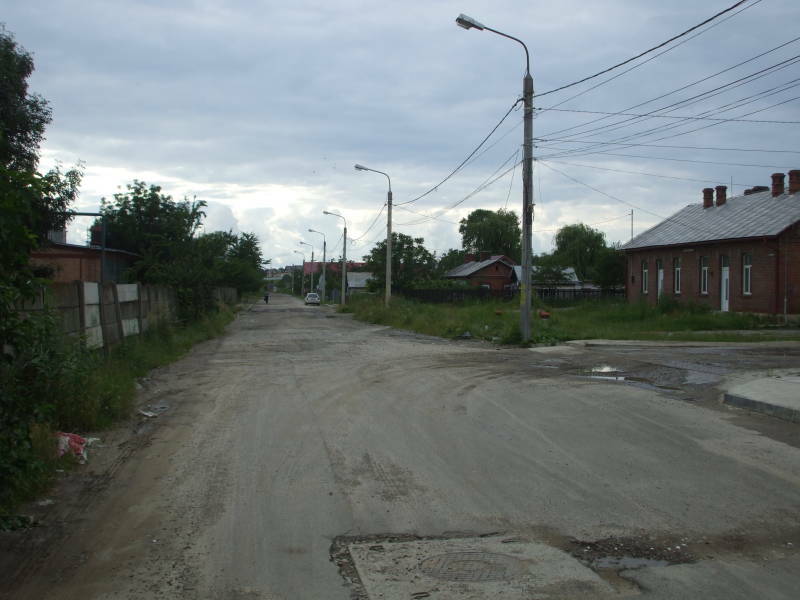 We did pass through one village later where we saw Ukrainian signs, but we were still solidly within Romania. Or, really, Bucovina, a region of its own now split between northeastern Romania and southwestern Ukraine. This was an area of Jewish settlement in the 1800s, but it is also a showplace of Romanian Orthodox church architecture dating from 1487-1532. This was the far fringes of the Byzantine Empire at times. There is much more about all that in the next leg of the trip, a few days in Bucovina. Just walk through the station and out to the main road, turn left, and Hilde's is a short distance ahead on the right side of the road. The next stage of the trip is three days in Gura Humorului and Bucovina.